One in five station-based Tube workers have been physically assaulted, according to research by a union. Staff have been threatened with knives and shoved towards train tracks, the Rail, Maritime and Transport union (RMT) said. Union bosses have called for action to tackle the "growing tide of violence" against staff. London Underground bosses said every assault was fully investigated and it was working with police and unions. RMT said its study involved more than 300 workers and uncovered an attempt to push a member of staff onto the tracks, a fare dodger brandishing a knife, and passengers using racist language. One worker told the union abuse was "a constant and common occurrence working on the Underground", while another said ticket inspectors were "regularly assaulted". The RMT's research suggested one in 10 Tube workers had been sexually harassed by passengers. RMT general secretary Mick Cash said: "There is a growing tide of violence and abuse across the London transport network and RMT members are at the sharp end on a daily basis. "It is time for the employers to end the warm words and take decisive action to protect both their workforce and the travelling public." 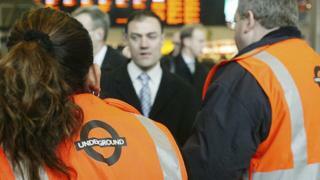 The union said it planned to raise concerns at a Transport for London (TfL) summit on Tuesday. Nigel Holness, managing director of London Underground, said: "Everyone has the right to go about their day without fear or intimidation and we do not tolerate any form of physical or verbal assault on our staff or customers. "We work closely with the police and their Workplace Violence Units to ensure that any assault on our staff is fully investigated and perpetrators brought to justice as quickly as possible. "We are committed to working alongside our trade unions to ensure our staff can do their jobs in safety."